Winter brings with it Arizona’s winter visitors, which means more drivers on the roads. We thought it would be helpful to provide tips for driving safely in Arizona. 1. Emotional driving leads to accidents. It’s not just road rage; it is also distracted driving, sadness, stress or exhaustion. With the personalization of the vehicle with cell phones, iPods and GPS devices it’s a miracle anyone can get anywhere without an accident. Easy access to friends and family can lead to emotional conversations while driving. In the article How Emotions Affect Driving from DMV.org it is suggested that drivers pull over to gather their thoughts and emotions before returning to the road. 2. Pull the vacation over. Parents a generation ago would pull the car to the side of the road when the kids started acting up. They threatened, “Don’t make me pull this vacation over,” which didn’t always work to quiet the disturbance. We suggest the same for modern methods of distracted driving; that includes being on the phone, texting, eating, drinking, and disciplining children or any combination of these while driving. 3. Stock up on water and snacks before hitting the road even if you’re only driving across a metropolitan area like Tucson or Phoenix. Arizona is warmer than other states, even in the winter months so a bottle of drinkable water can save you and your car in the heat of the day. 4. Get a GPS that tells you the directions rather than fumbling with maps or reading directions on a device. If you are reading then you are not looking at the road. Save yourself and others and make the investment into a quality GPS. Many cell phone service providers offer it as an add-on to their standard plans. 5. Buckle Up! If we teach children nothing else it should be to buckle up when they are in the car. Car accidents are the leading cause of death for children ages 10-19 according to BuckleUpAmerica.org. 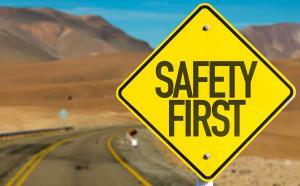 Children who see adults buckling up are more likely to buckle up and save their own life in an accident. 6. You’re not #1 if you’re giving other drivers the common #1 hand signal of irritated people. Honking and yelling aren’t the best use of time while stuck in traffic either. We can’t control the traffic, only how we react to it. If you’re that fired up, pull over and take some deep breaths to calm down before returning to the road. 7. Traffic laws weren’t invented for all drivers except you. Safety starts with you when you get in your car, buckle up and obey traffic laws. Signal when changing lanes. Don’t weave in and out of traffic; you may actually slow down your pace by doing this. Treat yellow lights as red and remember to look for pedestrians in populated areas. You could save a life. 8. Accidents: Unless you’re in it, there is no need for you to slow your vehicle and traffic by taking a look at it. You’re more likely to cause another accident than help in any way. 9. School zones aren’t optional. Cops mean business in school zones in the Phoenix area cities. They have been known to hide to catch drivers rolling through school zone stop signs or going over the designated speed limit. Not only is it the law but you could hurt a child on their way to school. 10. It says STOP, not PAUSE. Stop signs are not there to make your life inconvenient. They exist to control the flow of traffic both vehicular and pedestrian. This is why it is important to come to a complete stop.